Look at the list of places which issued local Postmaster provisional revaluations in 1920 and chances are, I think, that many will be places you have never heard of. Look at Kustanai. In what other context have you ever heard of Kustanai? It still exists and is today a city of 200 000 inhabitants in northern Kazakhstan. It's name is now normally transliterated as Kostanay, Qostanay or similar. There is a Wikipedia entry under "Kostanay"
In 1920, it was still quite new as a Russian town. It was founded as recently as 1883 and granted rights as a city in 1893. It was connected to the railway from Cheliabinsk only in 1912-13. Soviet power came to Kustanai in January 1918 [New Style]. But then, like much of Russia during 1919, it went under White control. The Red Army took back Kustanai in August 1919 as part of campaigns which saw it re-gain control of all areas of "Russia Proper" by the end of 1920. The Red Army stayed in Kustanai through 1920, a suitable base because it was a railway junction town. Only in October 1920 was a proper Kazakh Soviet government constituted, initially called (misleadingly for a non-specialist) the Kirgiz ASSR[ Autonomous Soviet Socialist Republic]. The Red Army was not only engaged in "Clear, Hold and Build". I read on the Internet, "In Spring 1920 forced seizures of grain, livestock and clothing began throughout the [Kazakh] steppe". These requisitions included not just organised, policy-directed seizures. Red Army soldiers acquired, legitimately or through looting, food and clothing which they could send home. Most Red Army soldiers were not local to Kustanai. They came from the Bolshevik heartlands between Petrograd and Moscow. So they sent home parcels - often large ones - by post. The Kustanai post office was busier than ever before, certainly busier than in Imperial times. That is why the Kustanai postmaster provisional overprints of 1920 are relatively common - in the Michel catalogue, they are valued as little as 15€ each. The stamps were used on parcel cards and (less often) Money Transfers, mostly sent to Petrograd, Moscow and other solid Bolshevik areas. 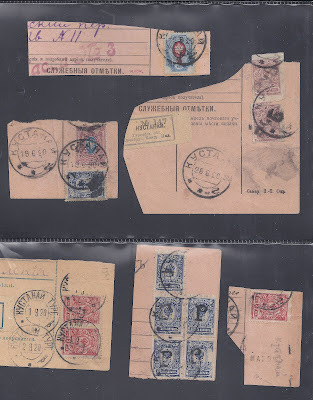 Sometime in the 1920s, the Commissariat of Posts and Telegraphs handed quantities of archived 1920 parcel cards and money transfers to the Soviet Philatelic Association (or other trade organisations) which had requests from collectors and (foreign) dealers for examples of Postmaster Provisionals. The SPA peeled stamps off the cards and cut them up in order to maximise the number of individual items for sale. That is why so many cards are in the fragmentary state illustrated above.